One of these two dragon-type legendaries (Latios in OR, Latias in AS) will forcefully enter your team about halfway through the game, when you reach the eastern side of Route 118. No fight is required. Once you receive the Eon Flute, a mandatory acquisition in Mossdeep City, you can use it to summon your dragon-type for exploring the world map. 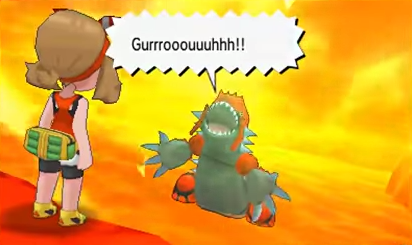 The mascot legendaries of Omega Ruby and Alpha Sapphire are fought as part of the main story of your respective game (Groudon for OR, Kyogre for AS). They're not that difficult to catch, but they're not exactly freebies either. You'll receive either the Red Orb or the Blue Orb for making it through the battle; these items allow their respective pokemon to undergo Primal Reversion. If you accidentally defeat Groudon or Kyogre, you can return to the battleground in the Cave of Origin to fight them again after defeating the Elite Four and the Champion. They'll continue to appear until definitively captured. This quest is much longer than that of most legendary pokemon. You can find the details in this article. Be prepared for a lot of HM wrangling. Rayquaza is the primary legendary behind the events of the Delta Episode, which is unlocked after you defeat the Elite Four and the Champion for the first time. When you reload the game the Delta Episode will begin automatically. Rayquaza is recruited to your team more or less automatically, as I think you're forced to capture it. (Very easy to do so, as well. Don't waste your Master Ball.) The final confrontation in the Delta Episode is against Deoxys, and it's much harder to catch. It's a psychic-type with considerable attack power but not fantastic bulk, and Recover makes catching the thing a real pain. Debilitating moves that inflict sleep or paralysis are recommended. If you defeat Deoxys accidentally you can return to the Sky Pillar after defeating the Elite Four and the Champion again for a second / third / fourth / etc. round. The remaining pokemon appear on several islands scattered throughout the world. These are only accessible via your Latios / Latias and the Eon Flute. You can only encounter one legendary at each location at a time, and you'll have to wait a while (somewhere between half a day and a day) to find another one at the same location. After finishing up with Groudon or Kyogre in your version of Pokemon, head to the Sea Mauville, a location just north of Route 108, west of Slateport City's beaches. Enter the Sea Mauville and Dive down once you're within the bowels of the ship. If you go as far south as you can you'll find a path to the engineering room. Head down the stairs on the right side of the room and search the seam between the two largest deck plates at the foot of the stairs. Do this properly and you'll find the Scanner. Take the Scanner to Captain Stern, who's hanging out at Slateport's Ferry. He'll offer to trade you the Clear Bell (OR) or the Tidal Bell (AS) for the Scanner. Once you have one of these items, return to the Sea Mauville and check out either the rear, raised deck of the ship (OR) or the engineering room where you found the Scanner (AS). You'll find a dark ring waiting. Approach it and either Ho-Oh (OR) or Lugia (AS) will emerge to challenge you. Ho-Oh is fire and flying; Lugia is psychic and flying. Prepare accordingly. As with Lugia and Ho-Oh, finish up with Groudon / Kyogre in your version of Pokemon. Head to Route 120 and look for a spot in the north of the Route where you can Surf. It's through a big patch of tall grass. Surf south to find a cave known as Scorched Slab. You'll find Heatran inside, on the bottom floor, manifesting as another black ring. Heatran is a steel- and fire-type, so fire-type moves are a happy medium for whittling down its health without outright killing it. The Pathless Plain. Pacifidlog Town is on the left of this shot. 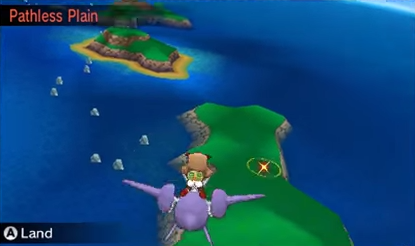 The stalwart fighting-types of Black and White are located on on the Pathless Plain, a larger island just south of Pacifidlog Town. It's difficult to miss if you know where to find the town, though the location will only appear if you have at least one pokemon on your team with maxed EVs. Interact with the ring and you'll get into a battle with Virizion, Cobalion, or Terrakion. They're all fighting-types, so try not to engage 'em with psychic-types unless you want to take them down. The three psychic-types of Sinnoh are found in the Nameless Cave, found just off the coast of Sootopolis while riding atop your Latios / Latias. It will only appear on the map if you have three or more pokemon with maximized happiness. (Thanks to Liv in the comments for pointing out my terminology flub. Stupid Pokemon Amie.) Inside the tiny cave on the island you'll find a formation on the ground that should look familiar to fourth generation Pokemon players, and if you approach the black ring inside you'll confront an Uxie, an Azelf, or a Mesprit. All three are a bit more fragile than the average legendary pokemon, so don't attack 'em too zealously. Uxie appears between 8 pm and 9 pm, during sunset, while Azelf appears at night and Mesprit appears during the day. Once you've captured Uxie, Azelf, and Mesprit, put all three of them in your party. This will create a spacial rift above Dewford. Approach it while flying and you'll get into a battle with either Dialga (AS) or Palkia (OR). Get both of them in your party simultaneously and the rift will reappear, this time with Giratina waiting inside. All three are dragon-types, though Dialga adds steel, Palkia adds water, and Giratina adds ghost. The black-and-white dragon duo of the fifth generation will only appear on the overworld map if you have a level 100 pokemon on your team. Do that and a location named Fabled Cave will appear on a larger island south of Mauville City. Enter the Cave and you'll face either Reshiram (OR) or Zekrom (AS). Both are dragons, but Reshiram is fire-type while Zekrom is electric-type. Once you've collected both of them, a new area called Gnarled Den will appear near Fallarbor Town. Inside you'll find Kyurem, a dragon- and ice-type pokemon. The first two genies will only appear on the map if you put a Castform in your team (probably the one you got from the Weather Institute). Do this and a storm cloud will appear over Fortree City. Fly over and you'll fight either Tornadus (OR) or Thundurus (AS). Once you've managed to get both of these pokemon, put them in your party and you'll find another storm above Fortree. This one contains Landorus. All three are flying-types, but Thundurus is part electric and Landorus is part ground. Perhaps the most annoying pokemon to capture on this list is Cresselia, as it appears out of blind chance. You'll find Cresselia on a small island south of Ever Grande City, but like the Mirage spots that crop up each day in Omega Ruby and Alpha Sapphire, there's only a small chance that Cresselia's Crescent Isle will appear. You can bolster your chances of getting it by StreetPassing, or otherwise interacting online with, other players. Cresselia is a straight psychic-type pokemon. Is there a waiting period between catching the beasts? Yeah, it's somewhere between half a day and a day. I'm not absolutely certain. What about cresselia on the crescent island? Can you post a picture of you flying above The Pathless Plain? I can't find it. Thanks in advance! Is There A Legendary On Mirage Island? And What About Mirage Forest? And What About Mirage Cave too? It says i'm typing at 5 in the morning when i'm typing at 7 am. WIEEEERRRDDD!!! I haven't actually caught Cresselia yet, 'cause the stupid island won't appear for me. Hence it's not up here. No clue what triggers it. Once I find out I'll stick it up here. Anon #2, Pathless Plain should be RIGHT beside Pacifidlog Town. It's one of the harder spots to miss, which makes me think it just hasn't popped up on your map. Some additional research has yielded the fact that you apparently need maxed-out EVs on at least one pokemon in your team to make it appear. That might be your problem. At any rate, picture will be posted momentarily. Anon #3, as far as I know there are no legendaries on any of the Mirage islands. They're a whole other once-a-day beast that's gonna drive me a bit crazy for a while. Suffice to say that you can land on 'em and potentially find pokemon you won't find anywhere else, and they change all the time. CreeperNation, yep, the timing on this website is preeeeetty funky. It doesn't match up for me, either, and I own the dumb thing. Blame Google. What about dialga and palkia? Cobalion can be captured on Sundays, Wednesdays and Fridays, Terrakion can be captured on Tuesdays and Saturdays and Virizion can be captured on Mondays and Thursdays. For Raikou, the time needs to be between 00 and 20 minutes past the hour, for Entei the time needs to be between 20 and 40 minutes past the hour and for Suicune, the time needs to be between 40 and 00 minutes past the hour. Uxie can be found between 20:00 and 21:00, Azelf can be found between 21:00 and 03:59 and Mesprit can be found between 04:00 and 19:59. - I think. These three are hard to pin down. Sorry, forgot one final thing; Giratina appears in the exact same place as Palkia/Dialga if you have them BOTH in your team. Trading is required. Dangit. Yep, forgot those guys. I'll add them in. What happens if you fail to catch one of the legendary pokemon? Do they let you try again at some point? As far as I know, yes. If you beat one up accidentally you can go back to the same spot and fight it again. For the storyline legendaries you need to beat the Elite Four / Champion to reset the legendary; the rest you just need to fulfill the conditions again. I beat up Tornadus on my first try, for example, and landed at a Pokemon Center - and when I went back up into the air it was immediately ready for another round. They're not in it. Pretty sure they were in X / Y; you'll have to trade for 'em. By pure luck I was able to find and get Cresselia. Fairly easy if you find the Isle. Used Ho-oh to get her in the red then only took less than 10 ultraballs to capture her. Pleasantly surprised! Thanks for the help on Cresselia, guys. I finally got mine this morning. I'll edit the info into the article. Should finally have a useful Mirage Island / Forest / Whatever article soon, too. THAT... is an excellent point. I tend to forget Pokemon Amie exists. Thanks very much. i caught uxie also do you need mesprit, uxie, and azelf all in the party to trigger the palkia/dialga event? Yes, the dragon of your version won't appear until you have all three in your party. can you get: mew, mewtwo and celebi? Nope to all three. As far as I know the legendaries listed above are the only ones you can get normally. Mewtwo appears in X and Y, and Mew / Celebi have pretty much always been event-only pokemon. Um, I'm standing in Nameless Cavern right now, interacting with the mysterious ring but nothing's coming up. I've already caught Latias, Kyogre, Rayquaza, Deoxys, Lugia, Entei, Raikou, Suicune, Heatran and Terrakion but none of the Lake Trio is showing up. Help? I had accidentally defeated both Coballion and Virizion. Will they spawn again in game? As far as I'm concerned, yes, they will spawn again if you defeat the elite four again. But, to play it safe, I would suggest saving the game before attempting to capture the Pokemon, and then Soft Resetting ( L+R+Start) if you fail to catch them.